Full disclosure: I cannot cook for beans. My name is Alexandre Pouille and I am a sophomore at the college. When I am not giving tours, I’m involved with a lot of things around campus, including my role as Executive Producer of Everyday Gourmet. The idea to start a cooking show was initiated about a year ago, when WMTV, our television station, was trying to diversify and attract more people to the channel. Our decision came down to this: Serve Food: If you want to host a successful event on campus, give people something to eat. What better way to attract people to a television show then by making them even more hungry? The show has been wildly popular since it debuted last year. In 2009, we’ve just finished our 10th episode, and acquired $15,000 of new equipment to help bring the television studio to date. It is a very exciting time to be in the cooking show business and I am happy that William and Mary has been supportive of our show from the start. 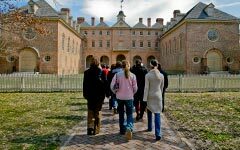 It is important to note that whatever your dream may be at William and Mary (domestic and international service trips, underwater basket weaving club, or judo) you and the school can make it a reality. I invite you to come back often to Everyday Gourmet’s new home on the web, (http://everyday-gourmet.blip.tv) to check up on all the great recipes and shows in the future.